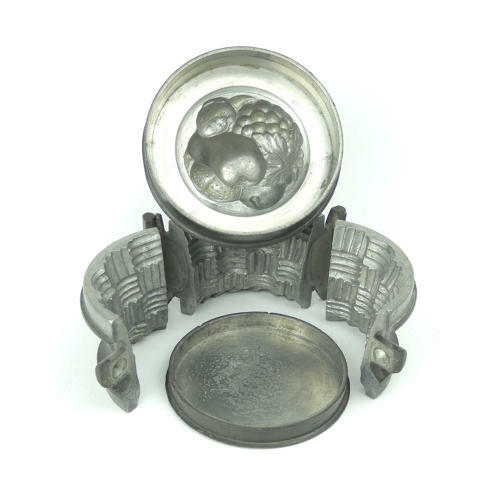 A super, Victorian, three part, hinged, pewter, ice cream banquet mould. This mould is quite charming as it is much smaller than moulds of this type usually are. There are no manufacturers marks and it dates from c.1870. The mould would produce a small basket containing various fruits. The hinged sides are well modelled with the basket design and the top is moulded with a pair, an orange, a plum, a strawberry and a bunch of grapes. The design is very well detailed and the mould is in excellent condition. The interior is in very bright, usable condition and the exterior has a good, dark patina.